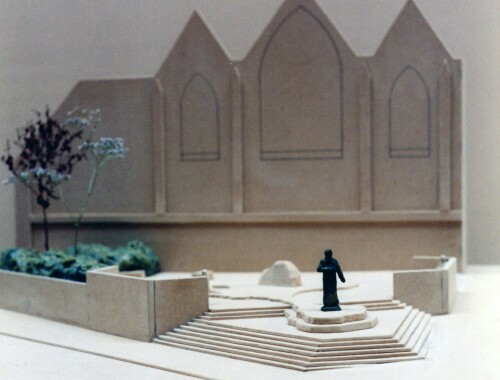 The memorial garden creates a place of peace and contemplation with levels of spiritual symbolism in tune with the theme of Cardinal Basil Hume’s life and work. It is designed to express Hume’s involvement and affection for the Holy Landscape of Northumbria and the northern Saints synonymous with it. The design incorporates all the crucial elements the Memorial Committee asked for. The Northumbrian landscape is reflected in the memorial garden by the islands, Holy Island (Lindisfarne) and Inner Farne as raised carved sandstone shapes (by copyright permission of Ordnance Survey). Holy Island with its western lobe on the main steps becomes an unconventional plinth for the statue of Basil Hume; running under statue’s left hand is the position of the causeway from the mainland to Holy Island. Inscribed on the top surface of Inner Farne closest to the Cathedral, are the names of St Cuthbert (c.634-87), monk and bishop of Lindisfarne and St Aidan (d.651), first bishop and abbot of Lindisfarne, who were both hermits on the island. The National Trust gave permission to remove a small boulder from the beach below St Cuthbert’s Chapel on Inner Farne. This is fixed on top of the island shape, constructed of four stone sections forming a cross. The sculptor had to make three trips to Seahouses before the weather would allow a crossing to Inner Farne to choose the boulder. On the shape of Lindisfarne in the garden is a three-ton boulder surrounded by smaller boulders all taken from a beach on Holy Island (by permission of English Nature). 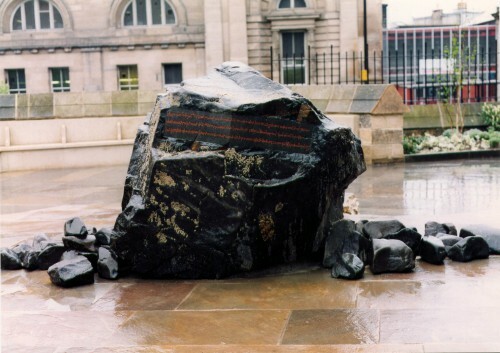 Combined with the boulder from Inner Farne it makes actual parts of the sacred Northumbrian landscape beloved by Hume integral with the memorial garden. Inscribed on one side of the large boulder, almost looking like it has been there for centuries is the 7th century Caedmon’s Hymn. It’s a facsimile of the text from the Moore Manuscript in the Cambridge University Library. Caedmon (d.680) was the first English Christian poet to write verse in vernacular (old English) and the 8th century script is in the Northumbrian dialect. Bede’s history tells how Caedmon, the illiterate herdsman, came to have a dream vision commanding him to sing of “the beginning of things”. The next day he was taken to the monastery at Whitby and was recognised by the Abbess St Hilda (614-680) as someone divinely inspired and at her request became an inmate of the monastery. Caedmon’s Hymn is a delightful poem, especially when translated literally from the early English. The alliterative translation by Charles W. Kennedy (Early English Christian Poetry, OUP 1952) is carved on an inset slab on the reverse of the boulder. Caedmon talks of the ‘Holy Shaper’ and ‘Eternal Monarch, making for men/land to live on’. 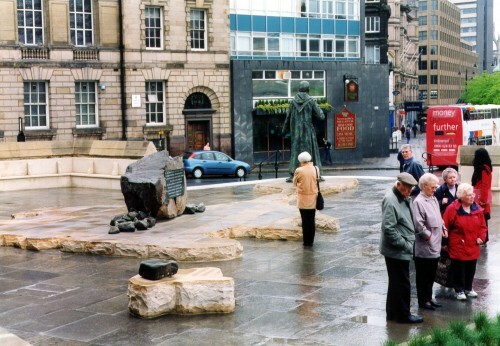 This is essentially the idea for the memorial garden and this translation provided the inspirational key for the design: The holy shapes of the land on which the northern saints lived and walked, the land that Basil Hume came from and admired. Caedmon’s Hymn from the same era poetically links the elements most admired by Hume: The Holy Islands of Northumbria and the Northern Saints, including St Hilda who encouraged Caedmon and St Bede who wrote about him. As well as using the actual shapes of the holy islands there is a spiritual allegory that incorporates the heights of the island shapes as symbolic levels to represent three stages of spiritual life: First Level: The whole garden level represents religious life in the world; Second Level: Holy Island in the garden, life in the church as a priest or monk; Third level: Inner Farne, life in solitude as a hermit. Each level becomes higher physically (and spiritually) and smaller in area representing the proportion of man in these spiritual states. Hume admired the hermits but didn’t have this tendency. His appropriate place is on Lindisfarne as a man of the church acting like a spiritual beacon, inviting/indicating the path to the land God made for man. 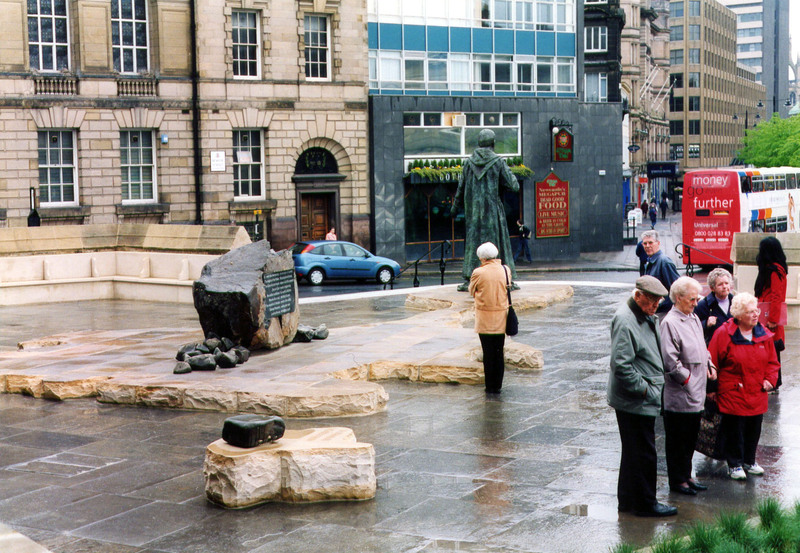 The statue of Hume facing Central Station welcomes people into the garden with his left hand gesturing towards Holy Island that he stands on. More generally Hume is also indicating the ground of Newcastle itself, his hometown and with a slightly oblique suggestion, the ground of St James’s Park upon which his favourite football team plays not so far away. The Memorial Committee wanted interaction with the statue and it was created with the idea that people would probably hold the statue’s left hand to have a photograph a taken. The 850 Kg bronze statue of Basil Hume portrays him dressed in Benedictine habit, the oldest ecclesiastical dress, with a Cardinal’s zucchetto (the red skull cap): a combination Hume regularly wore to express his role as a monk/cardinal. 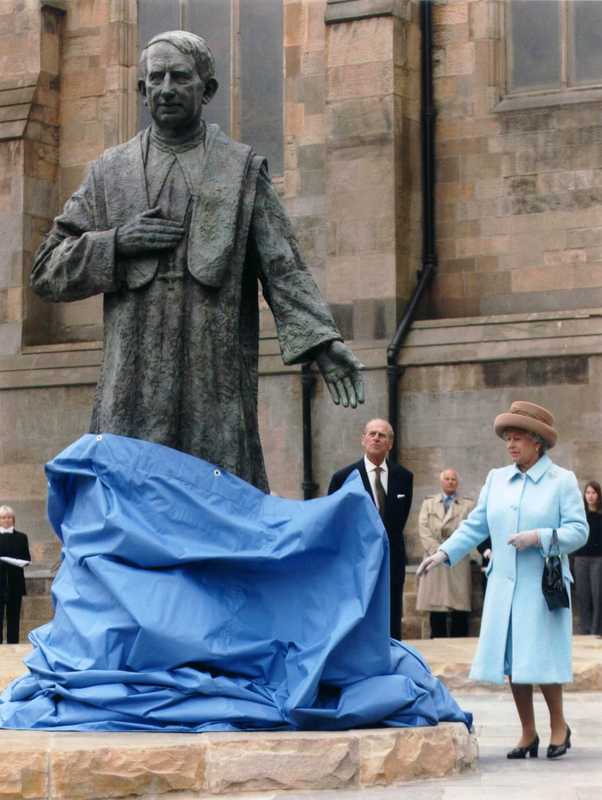 The sculptor was loaned a habit for the duration of the making of the statue which is three metres high and was modelled with two tons of clay on a constructed steel and wood armature. Hume’s right hand is characteristically placed on his breast and he wears the Cross of St Cuthbert. The seating arrangement uses recycled stone from the old containing wall to create a cloister effect that reflects Hume’s monastic life and creates areas for people sheltered from noise. The plants in the garden are species from the shores of Northumbria and the explanatory plaque is mounted an old building stone obtained from Ampleforth Monastery, discovered when the sculptor was researching for the memorial. The stone was removed during refurbishment of the old monks’ quarters and would have been in place when Hume lived there: so the garden also includes a part of Basil Hume’s spiritual and monastic home. CREDITS: English Nature and The National Trust : boulders from Holy Island and Inner Farne; Oxford University Press, New York: copyright permission for Charles W. Kennedy’s translation of Caedmon’s Hymn; Cambridge University Library: copyright permission – facsimile of Caedmon from the Moore Manuscript; Ordnance Survey: copyright permission to use the shapes of Holy Island and Inner Farne from their maps.